More Americans are looking for only Made in USA dog treats. Our pets are members of our family and we only want the best, all natural treats that are made right here in the USA. We support our companies that make their wholesome and all natural treats here in America. All of our treats that we carry have been "Lab" approved by our Labrador Retriever, Nia. They must meet all our criteria in order for us to carry them at our online pet store and we are very fussy about what should and should not be in a dog treat. Almost everyone is aware of the made in China chicken jerky problem. 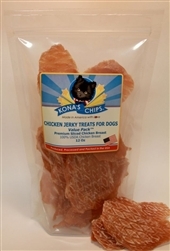 We have the finest made in USA Chicken, Beef and Turkey jerky from Kona's Chips. The founders of this company started making their own chicken jerky after their dog fell ill after eating imported chicken jerky treats back in 2007. Their jerky treats and chicken crunch treats are loved by dogs and cats too. They are made strictly of USDA certified meats with only salt added to their jerky. We carry Zuke's dog treats- Great company started by a man in Colorado that loves his dogs and wanted to create a line of all natural, healthy dog treats for his dogs. Almost everyone that has a dog is familiar with his Mini Naturals training treats. Sojos dog treats was created by two women originally baking their own original dog treat recipes from their kitchen. They are known for great tasting baked dog treats such as their Lamb and Sweet Potato and Duck and Cherry grain free treats and of course their treats made specifically for small size dogs. Sam's Yams sweet potato treats were created by a chef, named David that made a delicious sweet potato jerky treat with ridges. All of his treats are made from USA grown orange fleshed, sweet potatoes (yams). 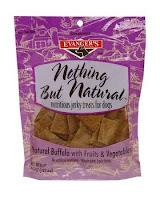 Evanger's dog food has a great line of freeze-dried dog treats and their Nothing but Natural Chicken or Buffalo jerky. This family owned company has been making great dog food since 1935. Isle of Dog products have always been recognized in the show dog world as having the best grooming products. Their new condition specific treats are so unique and full of only the best organic ingredients. Skin, Vital, Weight, Smile, Breath, Joint and Chill Out are heart shaped baked dog treats that actually help with specific issues your dog may have. Mickey's Pet Supplies is dedicated to bringing pet parents only the finest made in USA dog treats and pet products. Content copyright by Mickey's Pet Supplies. Powered by Blogger.